André Barbier was born in Arras, France on 24th January 1883 into a wealthy family of lawyers. At the age of twenty, Barbier left Arras and settled in Paris at the Quai aux fleurs, and in the same year, 1903, he began exhibiting paintingslandscapes and still-lifesat the Salons with four paintings at the nineteenth Salon des Independants, where he continued to show untiil 1914, resuning in 1967 until his death. From 1908-1938, he showed at the Salon d'Automme. He exhibited at the Societé Nationale des Beaux Arts in 1911 and at the Salon des Tuilleries from 1924-31. In 1926 he exhibited at the Retrospective at the Société des Indépendants and in 1937 at the Exposition Internationale. In pursuit of subjects for his landscapes, he traveled between Paris, the outskirts of Paris, the Normandy coast and the Riviera; he also travelled abroad, especially to Italy. In 1916 a major event took place in Barbier's life when he met Claude Monet and sent him gifts of fruit, flowers and one of his paintings. Monet responded with a gift of three pastels, and a friendship was born which was to last until Monet's death in 1926. Monet was so taken with Barbier's works that he sponsored an exhibition of his works with a preface by his biographer and friend, Gustave Geffroy, who urged him to "Build of mist and light, a world of poetry." According to Gérard Schurr, “Barbier uses his own distinctive style to outline, in a blue-purple flickering, some vague forms buried in a very delicate light in a skilful and discreet monochrome shade” (“Les petits Maîtres de la Peintures, Valeur de demain, ” Les Editions de l’Amateur, Volume II, p. 131). Nuees / Clouds. 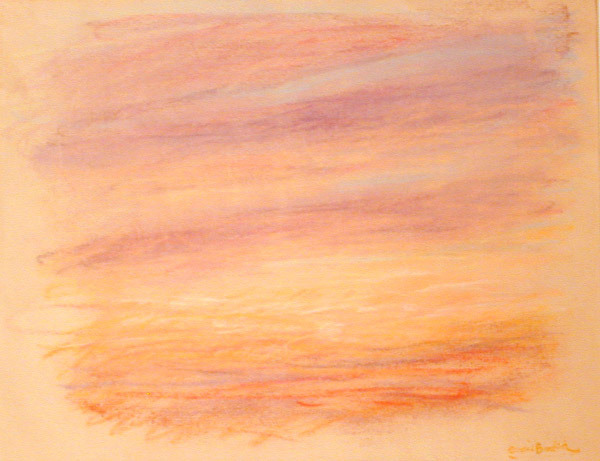 Original pastel, c. 1930. Image size: 134x207mm. Signed lower right.Price: $4500. For images from the Impressionist and Post-Impressionist show, click the links to go to the pages for Andre Barbier, Albert Besnard, Pierre Bonnard, Charles Camoin, Mary Cassatt, Paul Cezanne, Edgar Degas, Maurice Denis, Andre Derain, Raoul Dufy, Jean-Louis Forain, Paul Gauguin, Eva Gonzales, Henri Matisse, Pierre August Renoir, Georges Rouault, Ker-Xavier Roussel, Paul Signac, Henri de Toulouse-Lautrec, Suzanne Valadon, Maurice de Vlaminck, and James A. McNeill Whistler; for a review of the show that concludes, "Art exhibits in Madison rarely get this good," click review; to return to the home page or to inquire about price and availability, click home.